Feeling sad because Spring Training will be over? Maybe you don't care? 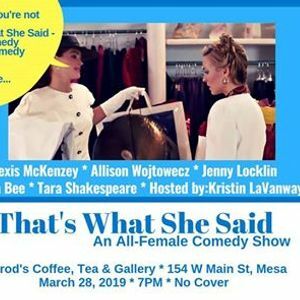 Either way, we have the answer for those end of March blues...That's What She Said - An All-Female Comedy show at Jarrod's Coffee, Tea & Gallery Thursday, March 28 starting at 7PM. Come on over and wipe those baseball tears away! No Cover! !